Every time I visit Pushkar, it reminds me of the famous Hollywood movie Eat, Pray and Love featuring Julia Roberts wherein she plays the role of Elizabeth Gilbert who ends her painful marriage and sets off on a holiday trip to reclaim her life. She discovers the joy of food in Italy, spirituality in India and love in Bali. If you are tempted to ask the reasons for this connection you need to wait and read further in this Pushkar travel blog. For those who have never heard or visited this place, it is a Hindu pilgrim town and therefore alcohol and non-vegetarian food is a strict no-no. But this doesn’t mean that food has taken a backseat. On the contrary, it is a melting pot of International cuisines and is a great place if you want to spoil yourself and enjoy the sins of gluttony! I am yet to come across a town in Rajasthan which offers a variety of Mediterranean and Italian dishes along with the local cuisines. You will find a better wood burn pizza in Pushkar at a far lower price in comparison to Jaipur. Pushkar is one of the few places where you can treat yourself to a great Banoffee pie which is impossible to find in most Indian cities. The food in Pushkar is scrumptious, fresh, authentic and cheaper! Pushkar being a holy town there are many temples. Looking at how different sources claim the number of temples in this holy town, I believe it runs in three digits. The most famous temple is Brahma temple which is believed to be the only temple dedicated to Lord Brahma. Personally, I liked the architecture of the old Rangji temple which has many different architectural elements. The new Rangji temple, on the other hand, is built in the style of a South Indian temple. Savitri temple is popular among international travelers because of a beautiful hike and the views. It is a holy place not just for Hindus, Pushkar is equally revered by the Sikhs. There is a big Gurudwara in Pushkar called Gurudwara Sahib, Pushkar Raj. The overall atmosphere is laden with a spiritual feel. 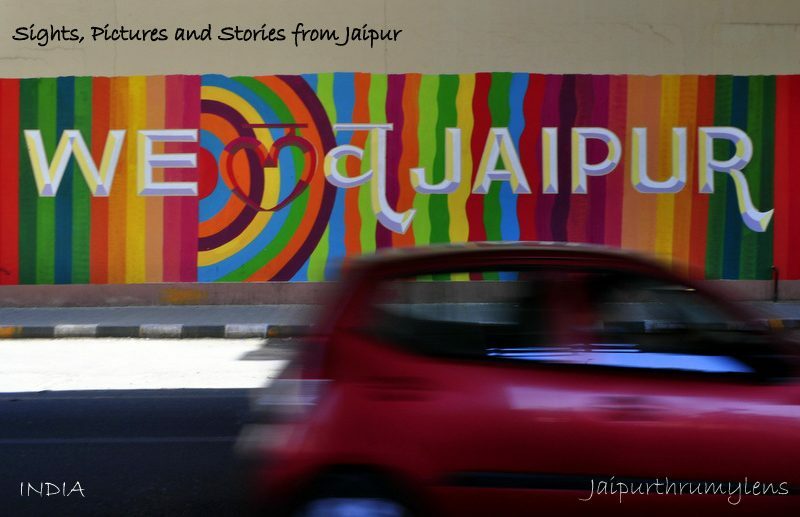 It is not just another town in Rajasthan. Religion is an important part of Pushkar. While Elizabeth Gilbert finds love in Bali after bumping into Felipe (Javier Bardem) I’m not suggesting that you will experience something similar in Pushkar! But I’m sure you will fall in love with Pushkar because it is not just any other place. This is one of the reasons why many foreigners visit Pushkar. The art of doing nothing! Sometimes doing nothing is also doing something – like enjoying one of the most beautiful sunsets ever! What do you think? It’s hard to miss the vibrancy of the main street which circumambulates the Ghats of Pushkar Lake. The streets are lively and there is a distinct buzz all around. The shops lining the Pushkar street have a variety of things to catch your attention from embroidered clothes, leather bags, a variety of handicraft items, costume jewelry, and so on. It is hard not to fall in the temptation and loosen the purse. On the other hand, the cafes, restaurants, guest houses and hotels billboards can be seen all around vying for your attention. You can find some of the most unique and absurd names of eating joints in Pushkar – Om Baba, Out of the blue, Honey & spice, The Laughing Buddha Cafe, Funky Monkey Cafe, Energy Cafe, A Blue Star to name a few!! The town is peaceful (except during the Pushkar Fair) yet there is so much that goes on here. Just sitting by the lake and soaking in the serenity is relaxing. Life is easy and unhurried in Pushkar. Everyone is chilled out as if life is in a slow mode. Pushkar is so very Rajasthani yet it is multicultural. I have never come across any other town with a similar appeal. Just sitting on the ghats of the Pushkar lake and watching the world go by and sun go down! Even though Goa (some parts of the state) and Mcleodganj have a similar vibe but people in Pushkar are far more friendly and it seems that they have accepted & assimilated other cultures in a much better way. It is difficult not to fall in love with Pushkar! Here is a detailed travel blog on Pushkar on places to see, visit, stay, and eat. It’s the ultimate Pushkar traveler’s guide. The life in Pushkar town is centered around Pushkar Lake. It is an artificial lake created in the 12th century by building a dam across the tributary of the Luni river. Hundreds of temples including the famous Brahma temple are located around this holy lake. There are 52 ghats on Pushkar Lake. It is believed that taking a dip in the holy lake of Pushkar helps to wash away sins. Taking a holy dip on Kartik Purnima (based on Hindu calendar) which falls in the month of November is highly revered as per Hindu customs and draws thousands of devotees to the holy town. Pushkar Fair also concludes on this day. Many people claim that this is the only Brahma temple in the world. I can’t vouch for the same. It is the top attraction of the holy city apart from the lake. The temple authorities claim it is 2000 years old but the current structure was built in the 14th century. The king of Ratlam provided financial aid to repair the existing temple. There are references that this temple was destroyed during the Mughal ruler, Aurangzeb’s rule and subsequently rebuilt. There was a big uproar earlier this year when one of the priests died and an official was appointed by the state authorities to manage the affairs of the temple. Photography is not permitted in the temple premises and there are instances when the unknowing tourists got harassed because of their “photographic adventures”. There are 52 Ghats on Pushkar and each of these have a history. These ghats circle the lake. None of them were built at once but over hundreds of years. What is important is the history behind each of these. Some of these Ghats have different names or were changed in due course of time. Like Man Gaht built by Maharaja Man Singh I, of Jaipur was later renamed to Jaipur Ghat. Similarly, Gau Ghat was renamed to Gandhi Ghat. There are information stones at each Ghat describing its name and history. The most important Ghat in Pushkar is Varah Ghat. It is a hotbed of activities. Evening Aarti or prayer is performed at Varaha Ghat. Apart from this Brahma Ghat and Gau Ghat are the most popular Ghats. The Brahmin Pandits are assigned to their respective Ghats. Shoes are not permitted on Ghats, you will find markings for removing shoe on each Ghat, it is best to comply with the guidelines. Photography on Ghats is a strict no-no, especially during the Pushkar Fair. There are times when you can click pictures but it is best to seek permission before doing so. What happens on Pushkar Ghats? Ghat is where people take a holy dip and perform religious rites. You will find a temple on each Ghat. Savitri temple is perched on one of the highest hills in the region – The Ratnagiri hill. Savitri is estranged wife of Lord Brahma and there is a very interesting mythological tale of Savitri temple. When Lord Brahma performed yajna at Pushkar, Savitri could not reach the site of yajna at the right time. He performed yajna accompanied by a local Gurjar (tribe associated with shepherds) girl, Gayatri who became the second wife of Lord Brahma. When Savitri reached the yajna site she became furious and out of anger, she went to a hilltop and cast a spell on Lord Brahma that he will be worshipped only in one place – Pushkar. As per the prevalent traditions Savitri is worshiped before Gayatri. People claim that the idols of Savitri date to the 7th century AD. However, the Savitri temple was built in the 20th century. It is difficult to verify these claims. The temple can be reached by hiking through the steps or through the newly inaugurated Savitri Temple ropeway or cable car. Many people prefer to hike their way up around sunrise or sunset. Be prepared for the monkey battalion on your way up. The Black Face Langoor are not very aggressive but it is best to hide all edible stuff in your bag. Old Rangji Temple is located close to Varha Ghat in the bustling market of Pushkar. I love its beautiful architecture because it is an amalgamation of various architectural styles, the prominent being South Indian temples. The temple is not very old and was built in mid 19th century. It is dedicated to Rangji, an incarnation of Lord Vishnu. The temple must have derived its name from Lord Ranganath who is highly revered in many places in South India. The best landmark to locate this temple? The streetside wrap vendors near Varaha Ghat. This is a new version of old Rangji temple built in a typical South Indian architecture style having a prominent and painted Gopuram. It is popularly called new Rangji temple but in reality, its name is Shree Ram Vaikunth Temple. There is a story associated with the history of this temple according to which, a rich businessman visited old Rangji temple in the night and the watchman denied him a Darshan. He became angry and decided to build a bigger temple – New Rangji Temple. I’m not sure if this is a true story but the temple is surely impressive. The temple was built by Shri Mungee Ram Ji Ram Kunwar Ji Bangur of Didwana, Rajasthan. The family owns the famous Bangur Cement, one of the most prominent Indian cement brands. Photography is prohibited. The temple trust allows only Indians to visit and have darshan in the temple. Escapades is an outdoor adventure facility similar to the one near Jaipur- Tao Experiences. I haven’t visited this place but a few of my friends did earlier this month and recommended this place. It offers similar adventure sports option like Tao Experiences – Paintball, ATV rides to name a few. If you are visiting from a country that offers all this back home, you might want to rethink. Some people call it Paap Mochini but in reality, it is Paap Mokshini temple. This temple is also called as Gayatri Mandir. It is situated on a small hillock providing a panoramic view of the holy town. It can be reached via an unpaved trail, a hike of 10-15 minutes. The temple is not opened throughout the day; only around sunrise and sunset. This temple is overshadowed by Savitri Mandir and therefore it witnessed only a few visitors every day. Apart from views and tranquility, there is nothing worth talking about. This place also makes for a great sunset point in Pushkar. Pushkar is synonymous with Camels and most travelers love Camel cart rides. I found a few Camel carts not far from the lake on Parikrama Marg but opted out of a ride because I’m against animal cruelty in any form. Therefore, I don’t have personal experience to share but you will find many operators offering camel cart ride in Pushkar. Jaipur Ghat is also known as Sunset point in Pushkar. It was built by Maharajah Man Singh I of Amer. Previously this was known as Man Ghat but later on, its name was changed to Jaipur Ghat. It is here you will find the sunset cafe which overlooks the Pushkar Lake and also offers the best sunsets in Pushkar. I visit Jaipur Ghat every time I visit Pushkar because this is the best thing to do in Pushkar. Often, this place becomes lively with tourists & travelers deciding to perform fire dance or showing acrobatics and so on. Last time, a bunch of local kids was dancing with the tourists. If you decide to enjoy some action, Sunset Cafe is the best place to relax and unwind in Pushkar. Tip! Although the sunset cafe is situated at one of the best locations in Pushkar, it is the worst place to eat. I have tried it so many times; the food at sunset cafe is always disappointing! Pushkar Gurudwara is called Gurudwara Singh Sabha. Previously, it was only a Dharamshala – a place to lodge but a few years ago a two-story Gurudwara was built here. During one of my trip to Pushkar Fair, I decided to visit Gurudwara and asked the person-in-charge for the significance of this town for the Sikhs. I was told that two of the most important Gurus of the Sikhs- Guru Nanak and Guru Gobind Sikh have spent time in Pushkar. There is a ghat dedicated to Guru Gobind Singh – The Gobind Ghat on Pushkar Lake. It is believed that Guru Gobind Singhs spent many months here when he was ousted from Anandpur by Mughal ruler Aurangzeb during the early 18th century. For a visit to Gurudwara, you need to cover your head with a cloth. If you are not carrying the same, you can borrow one from the office of Gurudwara management. Ask near the entrance. Do note that this is a religious place and it is perfectly okay to be denied entry. I’m sure the shops lining the market will tempt you with a variety of goods. Leather bags, artificial jewelry, clothes, and fabrics, decorative items, and display pieces will help you loosen the purse string. They are not very expensive in comparison to what you will pay in your home country. A lot of foreign businesses source clothes, bags and jewelry from Pushkar as it is a manufacturing hub and is reasonable. I have met many such foreigners during my trips. They spend weeks/months creating and sourcing collections from Pushkar. TIP: Don’t just buy instantly, look around and bargain. Be respectful during the bargaining process and it is best not to sound unreasonable. Pushkar has become synonymous with the Pushkar Mela and it draws thousands of visitors every year during Oct-Nov when it takes place in this holy town. Although it is a cattle fair, it is famous the world over as the camel fair. By rough estimates, the authorities claim that it attracted 25,000 photographers from all over the world in 2018! Many travel experts find it overrated but in my opinion, it still offers something unique. Where else can you find such a unique amalgamation of traditions and culture? One can get a glimpse of rural life, Rajasthani culture, and traditions. I have written a detailed travel blog on Pushkar Mela. A few of these have mythological importance. Lord Vishnu is said to have appeared at the Varah Ghat in a form of a boar. Lord Brahma is believed to have taken a bath and performed Yajna at the Brahma Ghat, along with by Lord Vishnu and Lord Shiva. Sikh Guru Govind Singh recited the sacred Guru Granth Sahib near the Pushkar lake. In 1615–16, the Mughal emperor Jahangir set up a hunting lodge near Pushkar Lake during his stay in Ajmer which is 14 km from Pushkar. Ajmer was under the Mughal rule. This was against the local law of not killing any animals in this holy area. Jahangir’s grandson Aurangzeb destroyed many temples in Pushkar along with other places in North India by issuing an order for which he is infamous. Various Rajput, as well as Maratha rulers, built temples on its ghats. A few prominent rulers to do so were Maharaja Man Singh I of Amer, Daulat Rao Scindia of Gwalior, and Maha Rana Pratap of Udaipur. As per Hindu mythology, Pushkar is regarded as Adi Tiratha and is referred to as Tirth-Raj. As per local legends, the Pushkar lake was created by Lord Brahma. Vajra Nabha, a demon killed Brahma’s children. Lord Brahma struck him with a lotus flower in retaliation. Vajra Nabha died and the petals of the lotus fell at 3 places, one of which was the site of Pushkar Lake. The reason for Pushkar to be named so has its reference in this story. The flower is called Pushp and Kar means hand in Hindi/ Sanskrit. So this act of lotus falling from Brahma’s hand caused the town being named as Pushkar (Push+Kar). Lord Brahma is supposed to have performed the yajna at this lake on Kartik Poornima, the full moon day of Kartik month in the Hindu calendar. To pay respect to the lord, thousands of devotees visit Pushkar for the holy dip in the lake on Kartik Poornima in November. It is also believed that the mystical water of lake cures skin disease, I’m not sure if this is actually true. Ajmer near Pushkar is well-connected with train network from many cities especially North India. It is 14 km from Pushkar. Since Pushkar is a holy city for Hindus, it has a direct train service from Haridwar/ Rishikesh too. Pushkar has a direct bus service from all major towns and cities in Rajasthan. Pushkar is 145 km from Jaipur and can be reached via a direct bus or taxi service. A regular train service – Shatabdi Express connects Ajmer with New Delhi. The nearest domestic airport is Jaipur. For those flying in from other countries, New Delhi is the nearest International airport. There is a direct bus service from Delhi too. A large number of tourists have reported scam incidents in Pushkar. Almost every traveler encounters travel scam in Pushkar. The scam in Pushkar has earned a name – Pushkar Passport. It involves tricking unsuspecting tourists into offering a religious ritual or a process to pay homage to your deceased ascendants. Some call it earning good karma! This ends with asking for money or donation. Some people may trick you with the word “free”. We all know nothing is free in this world. It is usually the priests who are involved in these rituals. Once you have paid money, they tie a Moli Dhaga (red thread) on your wrist which will ward off rest of scammers. People may approach and asks you to hold a flower or petal. This is a “sales” pitch for a scam. It may look harmless; it’s best to ignore and move on. If someone pitches for showing you lake or camel rides, there are high chances that they are scammers. It is best to do things on your own or search for a reliable person. How to avoid scam in Pushkar? Don’t respond to offers for accepting flowers/ petals or performing religious ceremonies. If you are in a group refusal in a very firm tone. Buy a Moli Dhaga from the market before heading towards the lake and tie it around your wrist. You can seek help from your local hotel staff for procuring one. This thread will send the scammers a signal that you have already been “scammed”. Choose the less visited Ghats on the lake like Jodhpur Ghat, Balunda Ghat, Chaudi Pedi Ghat or Gujar Ghat. The ghats around the main street like Varah Ghat, Brahma Ghat, Gau Ghat attract more travelers whereas the ones on the opposite side are more tranquil and less visited. You don’t have to pay any charges for visiting any temple or ghats so don’t fall for any pressure techniques. You can walk around ghats barefoot; there is no prohibition if you take off your shoes and socks. Choose early hours of the morning when visiting Pushkar Ghats. As I mentioned before Pushkar offers diverse food options right from the best roadside wraps to yummy Malpuas. Here is a Pushkar food guide to the best and famous things to eat in this holy town. Ganga Laffa and Falafel on Pushkar market street is well known for wraps and falafel. It is always buzzing with customers and there is never a dull moment during the tourist season. Everything is prepared fresh, therefore it takes time. Also, try their Masala Chai and juices/ shakes. You can also find Israeli brand coffee which is hard to find anywhere else in India. Pawan Restaurant also serves what Ganga Laffa does! It is hard to say which is better among the two. The prices are almost similar, Pawan being a tad higher. La Pizzeria is famed for its pizza and ambiance. In my opinion, the pizza was good but not exceptional. The prices are slightly higher in comparison to other places in Pushkar. The ambiance is great but it’s a small place. Honey & Spice near Old Rangji Temple is popular for its breakfast. There is nothing great to write about its ambiance but it is quite popular. The Laughing Buddha cafe is closest to the Brahma temple and it is on the first floor. I haven’t visited this place so I have no recommendations to share. People who love to sit out in the balcony with the street view will love this place. Om Baba Restaurant is at Varah Ghat. Situated on the 2nd floor, the ambiance is not worth mentioning. The food quality is average. Overall, nothing worth talking about except central location. Nirvana Cafe is also on the top floor at Varah Ghat. The green, red and yellow color reminds of Bob Marley. Blue Star is located on Jamni Kund road away from the main market and unlike most cafes, it offers seats in the garden. It is popular among travelers because it offers the authentic Mediterranean and Israeli food in Pushkar. From my experience, the quality of food is not always consistent yet I always visit this cafe. It used to be one the most popular cafes in Pushkar a few years ago but with many new options, all that has changed. Funky Monkey Cafe near Mahadev Chowk is one the popular cafes in Pushkar. With a small seating area, it is usually full. I make it a point to visit this place every time I visit Pushkar for shakes and juices. They have recently opened a bigger cafe on Jamnikund road near Blue Star and have a great ambiance. Sixth Sense is one of the best vegetarian restaurants in Pushkar. It offers a cozy place on the rooftop of an old Haveli which has been converted into a hotel or Inn Seventh Heaven and is at a walking distance from Varah Ghat. Do note that this place is open only for dinner and not lunch. The most popular thing to try here is Vegetarian Indian Thali. Caveat – The preparation is optimized for the western taste buds. Indians will be disappointed with slightly bland and not so spicy style of cooking. It is incredibly popular and often one needs to wait before being allotted a seating place. Om Shiva or Il Fornaio is also a rooftop cafe on the main Pushkar market street. It is diagonally opposite to Funky Monkey Cafe. This place offers both Indian and International cuisine. Even though La Pizzeria is rated as the best place in Pushkar for pizza, I found Il Fornaio a tad better both in terms of taste and value. Laxmi Misthan Bhandar near Gau Ghat is incredibly popular for Puri Sabzi, especially for the breakfast. It serves Aaloo Sabzi Puri for Rs 35 (with 4 Puri). Also, recommended – incredibly tasty Lassi. It is a crossover between famous Jaipur and Jodhpuri Makhaniya Lassi. Pushkar is famous for its yummy Malpua (Indian sweet). For uninitiated this resembles a pancake dipped in sugar syrup. There are many sweet shops offering Malpuas but Halwai Gali is the most famous. Halwai Gali can be located near Gau Ghat and you will find many sweet shops lined in it. Among the most popular sweet shops are Sarwadiya Misthan Bhandar and Sri Sarveshwar Sweets. Sunset Cafe is one of the most happening places in Pushkar. It offers a great place to sit and enjoy a sunset. Jaipur Ghat where it is based is extremely popular among travelers. One can sit here for hours and still not get bored. Unfortunately, Sunset Cafe food is a big let down. Overpriced and devoid of taste, it makes no reason for a revisit. As for the sunset, the public seating area guarantees a space for everyone. I’m sure this Pushkar food blog has covered almost everything that this town has to offer but certainly, this is not an exhaustive guide. Pushkar is famous among the backpackers and long stay travelers, therefore, it offers many hotels for backpackers. But all that is changing. Over the last few years, it has become incredibly popular among Indian travelers. It is now one of the popular places for a destination wedding in India. Sensing the opportunity and to encash destination wedding in Pushkar many new resorts and hotels have recently started operations. Ananta is one of the first resorts of Pushkar and it still is a popular choice. One of the reasons for its popularity is its location on Pushkar-Ajmer road. Westin Pushkar is one of the new entrants. Taj Gateway is also a fairly new resort on Pushkar Bypass. Of late, many new resorts offer swiss and luxury tent stay option in Pushkar. Aaram Bagh and Green House Resort are one of the more popular ones on the top end while there are many others offering a more economical option. Pushkar Resort is one of the oldest resort in Pushkar. Among the hostels in Pushkar Zostel, Moustache, and Pink Elephant are the most popular ones. If you are looking for backpacker hotels in Pushkar, bylanes of main Pushkar street is where you should hunt. I’m sure this Pushkar travel blog guide will help you to have a great time in this beautiful holy town in Rajasthan. Have you ever been to Pushkar? Is there something you would like to add to this ultimate guide to having a great time in Pushkar? What an exhaustive post of Pushkar with fascinating pictures. I’m book marking it to read later, as a bit under the weather. Thank you Arvind, for these well researched posts. Great place… although being from Rajasthan didn’t had an opportunity to visit 😅…but surely it is on my bucket list. HI! Happy to hear that you are from Rajasthan. I hope you get to visit Pushkar, someday! Where are you based? I am from Jodhpur. Hope you like Hampi! Great! The land of sun and Mirchi Bada! I’m sure I will. So where are you based? And how should I address you? Oh..😅 you can call me Shivam, currently based out of Pune. Looks just wonderful. I am always scam wary but it is easy to get caught when you are out of your own setting. Great pictures again too. It’s easy to fall in schemes as a tourists. Happy to hear that you liked it Orla. Appreciate your time and encouragement. You’ve done an amazing job with this post. I don’t think you’ve left any questions for me except this, “Do you think that there are a number of vegan options at these restaurants?”. Your pictures are beautiful as usual. Thanks, Trudy. Yes, vegan is quite popular so vegan food can be found here in many places. Appreciate your support and encouragement. Does it all look exotic from your part of the world? Actually, it doesn’t. It looks beautifully done. My parents aren’t American so I am comfortable being constantly exposed to non American things. I’ve always had friends from other cultures and we were always over each other’s houses for dinner so there was always exposure to the “foreign” and I love it. Living in NYC there aren’t many cultures that you don’t run across and that’s a blessing. Quite a comprehensive guide Arv—looks amazing! This is my first time reading about Pushkar in such detail. The Banoffee looks incredible, and I am sure it tasted incredible. Pizza too… 😀 Lovely to hear it’s not just a gastronomic place but one with views and abundant historical sights. So many temples, seems like impossible to visit all of them in one day. It was good, Mabel. Not all these temples are tourist places. Only a few of these are popular among travellers. Have you ever been inside a Hindu temple? You provided us with so much details about Pushkar, Arv. And the virtual trip amazed me as usual. Thanks for sharing with us. Very informative , Beautiful pics from Pushkar . Your posts are so detailed, so well written and beautiful photographs are attached, makes reading so enjoyable. I’m happy that you like these posts. I hope it will benefit readers. Thanks for sharing and appreciating. Thanks, Sheila. I’m glad you liked it. Have you ever been to India? How did you discover this blog post? I haven’t been to India, but I would love to go one day (I was told I lived a past life there). I found your blog by searching WordPress. I love Indian food, and all topics mind-body. Fantastic detailing and execution at its best 🙂 I was in Jaipur for a wedding a month back. Thanks, Nidhi. Jaipur is one of the top places for destination weddings. I’m sure you must have enjoyed the great weather out here though a lot of people don’t enjoy cold weather. I’m not sure how it was for you though you must be used to the slight chill living in Bangalore. It was an awesome grand India wedding showcasing Rajasthani delicacies , culture and traditions as well. There was an afternoon at the mango farms too. We did manage to sneak to Jhunjhunu Salasar and Khatu Shyam ji . Will be visiting again to ked in April. I can not attach pictures here, but yes they were very good. Would love to visit Pushkar sometime. How is it in April ? Just a thought. And how far is it from Ked? Pushkar is best between Nov- Feb. During April, days are warm. I haven’t visited Pushkar in April. If you have no other option, go ahead. You might have to curtail your outings in the day time. Oh , since I will be travelling with kids, I might give it a miss then. April- July is not really a great season for traveling in Rajasthan. Udaipur region is an exception though because it is not so hot. Hmmm thought so. It’s better we head back home and relax then. I’m sure Bangalore will be pleasant then. Yes. I love the title to this post of yours eat pray love , I think that’s what Rajasthan is all about . One of the most amazing books by Gilbert. Thanks, Nidhi. I feel Rajasthan is equally good for tourists and travelers because you can always add or deduct places based on your interests. Did you watch the movie? Yes true. It’s magical . By the same name. Eat, Pray, & love featuring Julia Roberts. Yes we are blessed with good weather, but also allergies and pollens in the air causing respiratory and skin issues. It’s very dry out here. Feb March April may are blazing here as well. Yes it’s better then, the evening rains are a respite to the sultry heat. But yes evenings are good in any season so an outdoor location is always preferred here. I keep hearing about all this. It takes 2-2.5 hours to reach Bangalore Airport from some areas which is equivalent to the flying time! What a joke! Thanks for checking this blog and sharing your thoughts. When did you last visit Pushkar? Was it recently? Is there anything that made it memorable? Great article! I loved reading it. Thanks for sharing. I’m happy you liked it. Is there anything specific you liked about this write-up? The virtual visit of Pushkar is very well detailed! I also like your photos. I have never been there but it is definitely on my list! Amazing…. I have went here and it’s an amazing place. But the way you have written this takes me back to Pushkar again. I’m glad you liked this post Kate. Did you visit recently? No I visited around December. What a marvelous post! So much useful and insightful information! Sarmistha, Pushkar is one of the places which I often recommend to people. I have realised that there are two different sets of people. Some like it and some don’t. It is based on the expectations and personas. People expecting this to be full of activities are bound to be disappointed. Pushkar is like a wine, you take it slowly. So if someone likes to do “nothing”, I’m sure he will love this town. International Food? Well, this is something you can’t miss. The food may not be 100% authentic but it is similar to the western taste buds. Low on Masala! Do let me know whenever you are headed to Pushkar, I can add some more tips for you. When did you last visit Pushkar? Yes I will definitely let you know before I visit Puskar. I was there may be a decade ago, it was different then from what you have described. It has changed quite a bit but not drastically. Travel is a big business so there are more cafes now than a decade ago. Also, now you can take a gondola ride to Savitri temple. Rest all is same. Previous Previous post: Khole Ke Hanuman Ji Temple Jaipur/ The Lure Of Dal Baati Churma?